Vietnamese Spring Rolls (Cha Gio) - BEST spring rolls ever! Deep-fried to crispy perfection and loaded with crazy delicious filling. These Vietnamese spring rolls make a perfect appetizer!! Vietnamese spring rolls, or cha gio, roughly means “minced pork rolls” in Vietnamese language. I don’t like most Chinese spring rolls or egg rolls served in the United States. They are mostly bad, filled with vegetables flavored with MSG. Some of them even taste like they are infused with a dose of antibiotics. I am not kidding. I am sure you have had one of those! But cha gio, the Vietnamese interpretation of spring roll, is what a spring roll should be. The filling is made of group pork, shrimp, crab meat, with shredded carrots, mung bean noodles (cellophane noodles/glass noodles), etc., and the end result is utterly delicious and tantalizing. The deep-fried, crunchy, and golden brown exterior of the Vietnamese fried spring roll is just another plus. The most refreshing part about Vietnamese spring rolls (cha gio) is that they can be served with fresh herbs and lettuce leaves. Eat them as is, of course, with nuoc cham (Vietnamese dipping sauce), or wrap your cha gio with fresh lettuce leaves and other aromatic herbs such as mint leaves (my favorite). Either way, they are deeply satisfying! If you like these Vietnamese spring rolls or Vietnamese food, you should check out the Vietnamese recipes on Rasa Malaysia. Vietnamese Spring Rolls (Cha Gio) - BEST spring rolls ever deep-fried to crispy perfection. Loaded with crazy delicious filling, a perfect appetizer!! Serve immediately with nuoc cham or roll it up with a fresh lettuce leaf and some aromatic herbs and then dip into the nuco cham. For buying tips about Vietnamese rice paper, please refer to this article by Vietnamese cookbook author Andrea Nguyen. I used the 8 1/2-inch round rice paper. Do not deep fry the cha gio on high heat because they splatter and most importantly, high heat causes the skin to bubble, break and burn. So patience is key, use medium to low heat during frying process. You can get the nuoc cham (Vietnamese dipping sauce) recipe on my Banh Xeo post (another great Vietnamese recipe). Cha Gio is also called Imperial Rolls in the United States, not to be confused with Summer Rolls. All photos and recipes on Rasa Malaysia are copyright protected. Please do not use the photos and recipes without prior written permission. If you wish to republish this recipe, please rewrite the recipe in your own words instead of copy and paste and link back to http://rasamalaysia.com/vietnamese-spring-rolls-cha-gio-recipe/. Thank you very much! Great post, I never thought these got enough credit, they’re tasty! I might be weird, but I’m a huge fan of noodles inside spring rolls. I agree, Dave. I also love the fresh Vietnamese spring rolls filled with noodles, too, they just taste great. In noodle inside spring rolls is to absorb all the water coming out from marinated process. It will help balance moist, flavor and keeps the spring roll crunchy for a longer time. This is the reason for a lot of Vietnamese recipes having a small amount of glass noodle as an ingredient. Wiffy – I also don’t like spring rolls with bean sprouts, it’s weird tasting and don’t seem to belong inside spring rolls. another great post and photos. we’ve made these with shredded jicama and even taro as well instead of carrots..perhaps slightly crunchier texture. Thanks Hong. I can totally imagine the taste with jicama and taro. Yummy. I tried to make what’s commonly served at Vietnamese restaurants here. I am a Vietnamese now living in Hanoi city. I love your food sure, and I visit this website almost every day. I hope you to try once our other traditional sping roll recipe which we cook for Lunar New Year. The ingredients is ground pork, 豆芽、蔥花、香菇末、木耳末、東粉、雞蛋、鹽、胡椒粉。You’ll like it, I think. LOL, you are right about the antibiotic spring rolls, they are often served at American-Chinese restaurants in the US. Big fat like burrito, and with the thick egg rolls skin and filled with antibiotic and cheap MSG cabbages, so bad. I prefer this Vietnamese cha gio, too, although Thai version is also similar but with the regular spring rolls skin. Kate, I know, they are the worst, those big fat thick skin egg rolls. YUCK. Can you tell me what brand or type of wrapper you used for this? From looking at your pictures, it’s the exact type of wrapper I am looking for, for the spring rolls. Some of the Vietnamese restaurants make their spring rolls with this wrapper and I can never figure out which type or brand they are using! Yes, I would have used black ear mushrooms if I had them. The Vietnamese restaurants here always include them in the filling. Not only do these photos look gorgeous, the food also looks scrumptious. Will it become oily if I serve it a few hours later? I’m thinking of making them for a gathering but of course have to prep a while before as I need to get bathed and dressed. Thanks! Yes, I would suggest you fry them before the guests come. They are not easy to make for sure. The frying part is hard. Oh Bee, I just watched a food show last night on Vietnamese food and the spring rolls really appealed to me. And then I see your spring rolls here. Time to make some. They look so, so delicious! One question, do the rice paper turn soggy after a while? chewy, so the sogginess is not that obvious I guess. I wonder if coating the prepared rolls with corn flour or brushing them with egg whites before frying will make the rice paper skin crispier for longer? LOL funny. Malaysian spring rolls are wrapped with jicama, I love it. My Chinese friend taught me another version (typically Shanghai it seems) with napa cabbage, ground meat, mushrooms and/or black fungus. She made it, I tried it and they were delicious. The filling is definitely “wetter” than Cha-Gio but that’s what makes it moist and juicy inside. I seldom order spring rolls in the US too. Guess it is due to the cost with the “risk” involved. What if I’m served lousy spring rolls (thanks for confirming the facts) ? Kekeke…getting too analytical here. Woops! Yes, I know the Shanghainese version. My cookbook has a similar recipe, adapted from my favorite Chinese restaurant, more moist and it tastes very good. I prefer the Malaysian style of spring rolls with jicama. Not sure about Singapore version. your rolls look yummy. i love making these things. can i ask you about your frying technique. i’ve noticed when making cha gio with rice paper that the oil gets rather “used” fairly quick, meaning after frying a dozen or so, even with skimming. also, that it’s a bad idea to wrap and wait a while before frying as the wrapper can get rather frail, and i’m rather careful that the filling is not too moist and the wrapper is not over soften. is this experience yours also? Yes the rice paper soaks up oil. I fried mine almost immediately after wrapping. They are not easy to fry, that’s why I recommend low to medium heat. Thinking if it is so problematic frying them wrapped in rice paper, maybe we can try frying the ingredients in a tablespoon of two of oil without wrapping them. Cha Gio is great! They can also be eaten with rice noodles and fresh lettuce and herbs and topped off with some nouc cham. Great Post! Mmmm these look great! Should I cook the pork and shrimp before stuffing the rolls? Yes, you can but the frying process will cook them so they will be over-cooked after frying. YUM! !are the summer rolls the rolls that are not fried and stuffed with shrimp and cilantro and glasseine noodles? ?please post a recipe for these when you can. They are one of my favorite dishes. Lovely post. These are called summer rolls at some restaurants, but the Vietnamese name is goi cuon. I am SOOOOO very confused about Spring Roll Wrappers. I have made delicious Vietnamese Spring rolls, that are made with the round opaque wrappers that are brittle and then you dip them in water and they become stretchy, and served cold…. but I am looking for the “egg roll type” not thick like that but thinner, is this what you used? I have seen frozen spring roll “pastry” on websites, what is this? I hope you can clear this up for me once and for all. LOVE your photos and your recipes, tried the Walnut shrimp the other day and other than adding a tish more condensed milk, they were amazing!! Shannon, I used Vietnamese rice paper, the ones you describe as opaque and brittle and dip in water before wrapping. Not sure about spring rolls pastry, never seen them. For Chinese spring rolls, I used the frozen square ones which is thin and crispy after frying. I think I know what she’s asking. There are three types of “eggrolls” floating around out there. There are the ones like in your recipe, made with rice paper, the thin brittle opaque stuff that turns stretchy when moistened, and are also used to make the (uncooked) basil spring rolls. When filled, rolled and fried, they make the most delectable rolls of all, in my opinion, and the the hardest to find. I simply can’t get them in Atlanta; all the Vietnamese restaurants here use the wheat based wrappers Shannon is referring to. I just have to make my own if I’m really craving them. The spring roll wrappers Shannon is looking for are thin and crispy when fried up and are mostly made of wheat, I believe. These are what you get in Thai restaurants and some Vietnamese restaurants (ALL Vietnamese restaurants in the Atlanta area!! If you know otherwise please let me know!). I’m not sure where to buy them. The Asian markets would surely have them. They are probably just called spring roll wrappers. Then there are the large Chinese eggrolls, which have a thicker less crispy wheat wrapper and are mainly stuffed with cabbage. These are the least desirable of the three, i think. I LOVE cha gio. It was my first taste of Vietnamese cuisine when I was a teenager. Funny enough, I’ve never made them myself, and I always thought they were wrapped with the same wheat-based eggroll wrappers, like the sad versions of Chinese egg rolls at take-out restaurants. So I’d resigned to not being able to eat them. What joy in finding that you make them with rice paper! I can SO do this in my home. Cha gio making party, here we come! Are these the same thing as nem? In France these fried spring rolls are on every Vietnamese menu, in the US I get greeted with a blank look when I ask for nem. Actually “Nem Ráng” is called by people in the north.”Ram” in the center and “Chả Giò” in the south. Over 90% of the Vietnamese living in the US and Canada are from south Vietnam. Thank you BYL for promoting all kind of yummy food. I love the veggie spring rolls — they are so delicious! I want a whole plateful of these! EVERYBOBY here love spring rolls, called “nem” here in France…. I always have a few in the freezer just in case….should friends drop by impromptu for “aperitif’ popular for an evening get-together “apéro-dinatoire” !!. Naturally the crispy rolls is a must when you are Asian. Your recipe seems much easier to make, I sure will try it this weekend. Just a question; how do you make the nuoc nam sauce, as I have already the pure fish sauce….what else should I add ?? If you look at the Cook’s Note, I link to my nuoc cham recipe. “Nem” called in France because that’s what northern vietnamese call it. Southern Vietnamese call it “cha gio”. Nice if eaten with hot spicy chilli! Hi. Thank you for your awesome recipes. I tried your orange chicken before and it was a hit in my family! Your rolls look absolutely mouth-watering delicious! I was wondering what kind of meat I can substitute in place of pork, since I don’t eat pork. Thanks once again. They look fantastic. I always order them at our local Vietnamese restaurant, Nam’s Red Door, but I have yet to make them myself. Your printed recipe is the perfect inspiration to give it a try! Sending you some Link Love!! I have posted you up today on my blog!!! I love your recipes! i love these. i am blessed to have a vietnamese mother and a mexican father. a by-product of the vietnam war. my mother makes these almost every weekend. we love them. my friends always ask when she makes them if i can bring them some. i tell them i will, if they make it home. lol. she uses pork, and shrimp. the noodles add a texture that the chinese take- out industry cannot touch. i found your blog on accident and now i am addicted. thank you. Hello, my Mother is Vietnamese and just to add a little extra flavor we fry our eggrolls in peanut oil. I think it adds that last little bit of flavor. I agree, peanut oil is the most aromatic of all. Wow! These look absolutely delicious! I am so glad I read your recipe. I have been making eggrolls for years, and I have always had a problem with the rice paper skins. I did not know you had to fry them on low to medium heat. Every time I have tried using rice paper, they would break open, and the filling would spill in to the oil. I have found acceptable substitues, however, they just don’t taste as good as the rice paper! I can’t wait to try these! Your website is AWESOME. Thank you! Hi, I’ve tried making Cha Gio before and it was delicious. However, I’m awful at estimating how long it takes to throughly cook through the pork. I ended up with some being too dry on the inside as I’ve fried it for too long. Any advice on how to estimate that? Another thing is, how much oil did you use to fry it? As in, covering the rolls partially or fully immersing the rolls in the hot oil? Hi Eli – thanks for your comment. For the oil, you need to make sure it’s cover the rolls completely to make sure they are cooked properly and through. Too little oil will mean that the heat might not be enough to cook it through, hence the uncooked pork problem you experienced. Good luck. I am a fan of your website even though I only read it for the last few days. I love food and cooking and I just want to share a bit knowledge of Viet Namese spring rolls which I collected from my travel in Viet Nam. There are a few versions of Vietnamese spring roll in Viet Nam. The recipe you described has influence from the Northern Viet Nam style. However, Northern Vietnamese often put beansprouts inside (the real fresh beansprouts do not have strange taste, pity that nowadays most of us can not buy fresh vegetable any more, most of them are kept in freezer for a long time before selling to us). Southern people often use taro instead of beansprout, and shrimp is main ingredient for central of Viet Nam spring roll. 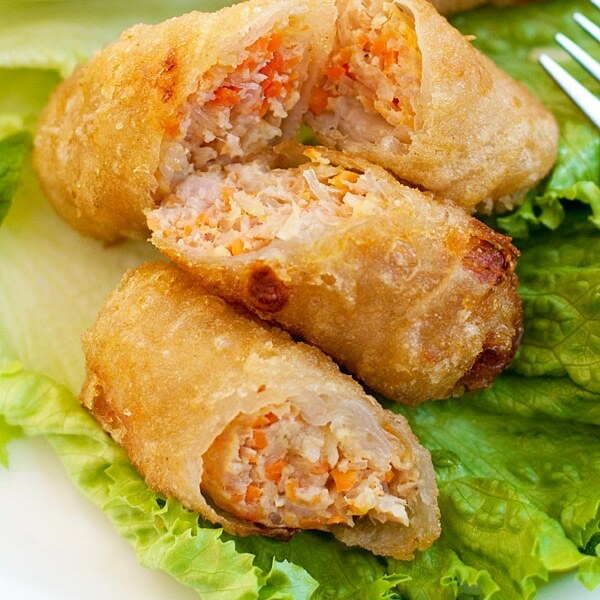 The spring rolls with crab and shrimp meat originated from a coastal town in the north. It is the only place where spring rolls have the squared shape. In the authentic Vietnamese cooking, there is no carrot or garlic in spring rolls. Instead, there is always black fungus (or cloud ear fungus, 云耳) in the spring rolls. Thanks for your information. It’s great to learn so much about cha gio from you. I have yet to go to Vietnam but can’t wait to try out the real version. A great tip I learnt from my relative in Vietnam… use lemon water to wet your rice paper, this ensures a crisp result from deep frying. Thanks for the great cha gio recipe. I can’t wait to try it! I was wondering would it be possible to fry them and then store them in the freezer for later? I am wondering where can I get Taochu is US, I went to Asia grocery store, but they do not have it. Hi. I love your site and congratulation on your new cook book. I tried to make spring rolls using rice paper before (my husband is a coeliac) but the oil spitting so much and the rolls absorbed too much oil (disgustingly greasy). Could you give some suggestions to avoid those? I love any kind of springrolls but I want my husband to be able to enjoy it too. You indeed have a good taste. Vietnamese spring rolls, egg rolls are very much better than the Chinese. But the “chả giò” recipe above is the egg roll recipe. These rolls traditionally are eaten with Vietnamese soft rice noddle + mint + bean sprouts + fried onion + flavor fish sauce. And the sauce is either the fish sauce above or flavored bean sauce. The bean sauce is a mixture black-bean sauce (you can buy it in any Vietnamese market) and another grounded boiled bean (green bean or peanut will be great) + fried onion + fried garlic. You are talking about Rice Paper Rolls which are “roi cuon” in Vietnamese . the Recipe above is for “cha gio” which are spring rolls but they are rolled in rice paper instead of spring roll wrappers and fried . If you look in the photo above the wrapper is very noticeable. Just another way of doing spring rolls. Hi! I made these tonight, and used chicken (which I minced) instead of the other meats, as it’s what I had on hand. Delicious! I did find that running the wrapper under the faucet for about 3-5 seconds, then letting it sit for 30 seconds made them easier to roll. I will definitely be making these again! Correction. These are NOT Vietnamese spring rolls, spring rolls are never ever fried. You’re thinking of Vietnamese egg rolls, which uses rice paper instead of the regular eggroll sheets and shredded/minced ingriedients. Rasa is right, Merina! That dish is spring roll or “chả giò” called by South Vietnamese (it’s called “nem” in North Vietnam). The dish that you mention is called Vietnamese fresh spring roll or Vietnamese salad roll or Vietnamese rice paper roll or Vietnamese summer roll. Don’t ask me why there are so many English translation. Vietnamese name for this dish is “gỏi cuốn”. I’m Vietnamese. Hi do I suppose to fry the pork first for the filling? or leave it uncooked and roll it? Also, do you think the unfried spring rolls will last in the freezer if I have leftovers? Or will it turn hard and crack? Best not to freeze or you need to defrost before frying also the texture of the filling might change. There are variations of this recipes. It all depends on your palate. We do not use crabmeat, and we also use jicama and wooden ear mushrooms. The rest of the ingredients mentioned in this recipe are pretty much the same. With jicama, we lightly cook it first first with a little pinch of salt. After it cools down, we use our hands to squeeze the excess liquids out of the jicama. Once you mix it with other ingredients to make the filling, this will prevent the filling from turning soggy. We also use wheat paper instead of rice paper. When we make them, we make them in a batch of 200-300 at a time and freeze them uncooked in a heavy duty freezer zip loc bags. When you set them out to thaw them (no defrost), just make sure you line them in a single layer on a several pieces of paper towels. This will keep the spring roll wrappers dry so when you fry them the wrappers won’t break apart. Hey in regards to the freezing, are these done with the rice paper rolls? I’m worried once you thaw them out, the rice paper is too thin to hold onto all the moisture? i also heard it’s good to pre fry them and then freeze them? Spring rolls certainly taste much better if they are fresh. But the next best thing is to make the spring rolls in a larger batch and deep-freeze them by placing in an airtight container. This will save me time. I normally minced the pork and stir-fried it before mixing with other ingredients of the filling, just to ensure it will be fully cooked since I adopt the ‘direct from the freezer’ deep-frying method. We use jicama. It gives you this crunch taste when you eat the fillings. Thank You , Thank You, Thank You!!!!!!! I can’t believe how close these are to restaurant quality. With some tweaking they will be perfect. we call them Nem in the french-speaking world… and yours are perfect ! Hi, this recipe is such a Godsend. I’m just wondering, could another type of sauce be replaced for the fish sauce? Anyone could answer (^_^). Thanks so much! I live in Atenas, Costa Rica (in the middle of the rain forest)and REALLY miss Vietnamese food! But some of the ingredients are impossible to find here…but…I substituted rice for the noodles, added some finely shredded cabbage, had to leave out the crab and fish sauce [sigh] Also, i live alone so had to 1/2 the recipe! Still wonderful! I love your site, it is such a time-saver! I got a book with quite a few traditional Chinese recipes, but your site is awesome with all the recipes from the East I could want in one place! My rice paper rolls kept turning out terrible cause I tried cooking them like the deep fried egg roll recipe and they would expand and rip open! I am excited to try them again now! This is a challenging recipe mostly because of the rice paper wrapper. You can use regular spring roll wrapper for ease of use. Yeah, it is. I am trying to learn how to diminish wheat in my diet to extensive studies of health and having to much wheat in the diet is not good and it is overused in supermarket ingredients. I will play around with different heat levels on the oven range. The rolls did not bubble up and tear open like last time, but I think this time I turned the heat down to much. Next time I will turn the heat up a little bit higher but still lower than deep frying temperature. Whatever you choose to call these rolls, they are delicious! I like to replace a little of the ground pork with a bit of finely sliced scallion, a few chopped up bean sprouts, a few woodear mushrooms, and a little bit of diced water chestnut for crunch. What really knocks it out of the park though is the nuoc cham sauce. I like fish but, even if you do not, don’t let the fact that the main ingredient is fish sauce scare you from trying it. It’s insanely good! Some rolls, a big bowl of nuoc cham sauce and some fresh herbs (my favorite is cilantro but mint and Tai basil are also excellent) and I’m in clover. Thanks for posting this recipe! Hi, thanks for posting this delish recipe. I just tried making these and the filling is perfection, however my rice paper turned out crispy, white and translucent. Did I fry them over too low a heat? love this rolls and want to try this recipe! how many rolls will this recipe make? is 1 medium carrot shredded enough? i had tasted these cha gio prepared by Vietnamese in Msia. Really tasty. Thank you for the recipe. This looks just like the spring rolls I order at my favorite vietnamese restaurant! I love the texture and how crunchy these are. I can’t wait to make these! However, I’m a little confused as to what kind of wrapper to use. I make summer rolls often using rice paper that I soak in warm water for a few seconds before adding the filling. Do I use the same rice paper to make these? Is there a certain brand you recommend? husband was craving vietnamese spring rolls and i made this, he said its just like he had in vietnam. We didn’t have pork mince so just used chicken breast minced up instead. wow yum! thanks Bee! this is going to appear on christmas lunch table! Thank you for the recipe. I’m gonna try this one. We’ll be serving it in my restaurant. Thank you again. I love your recipes.. Keep it up. Hi, can you please tell me how many springrolls this recipe is? I have to make about fifty for saturday!! I have a friend that is half Chinese and half Vietnamese, and his mother makes the BEST Vietnamese Egg Rolls.. She calls them (what sounds like in English) chai ‘ya.. Is this the same thing as the recipe here?? Thanks in advance for any info on this…! PS Love your recipes.. Keep up the good work!! Hmm I am not sure. I’m Vietnamese and yes that is the same thing as the recipe here. It’s spelled cha gio, pronounced kind of like chai yaw. Two people have asked, but were never answered: How many rolls does this recipe make? I would like to make these for a party, but I need to make enough for a certain number of guests. All of your other recipes show a yield, but not this one. It serves 4 people as appetizer. I was always greedy of spring rolls which I often eat in vietnamese restaurants here in Italy. Now with your instructions I can make them at home without major problems and also the ingredients seem readily available in local markets. I will try them this weekend! Hi Jude, thanks so much for your comment. Yes, I think it’s perfectly fine to steam but it’s not going to be cha chio. But I can see that it might work for many people who are health conscious. Stupid question, but the pork and shrimp is raw before frying, correct? It does not say anything about cooking before so I wanted to make sure. Yes, after you deep-fry, it would be cooked. I must try making them your way. I usually just improvise with fresh veggies, ground pork, ginger, scallions, pepper, and soy sauce. I like the rice wrappers and the flour wrappers. I don’t loathe the American style. However it must be telling that my improvised spring rolls are so much tastier than egg rolls in Chinese restaurants. I’m pretty lucky to live within walking distance of a Vietnamese market. Having easy/affordable access to good ingredients helps so much. I made these today. Simple and easy to make and taste great. This recipe is definitely a keeper. Delicious! Could I store the rolls to fry later when my guests arrive. If yes what way is the best? Not sure what I’m doing wrong but my fried rolls are not coming out crispy, rather it’s chewy. I’ve tried both the 3 ladies and bamboo logo rice paper and the even after frying for about 10 minutes the rolls don’t turn brown.. they remain white. Please help. I am so sorry to hear that. Certain brands need extremely high heat to become crispy. Also, they won’t become brown like regular spring rolls wrapper.